There is nothing easy about the moving business. When I started my business, I worked seven days a week. Non-stop, constantly on the phone, with the office phone always forwarded to my cell phone. Every end of the month, for two to five days, I’d sleep at the office. I’d have trucks out until 2 AM. It was a grind. That’s not where you want to be, but sometimes that’s where you have to start. Anytime you’re trying to grow in your life or in your business, you’re going to hit roadblocks. Respect that struggle for what it is. Know that it’s part of the process. 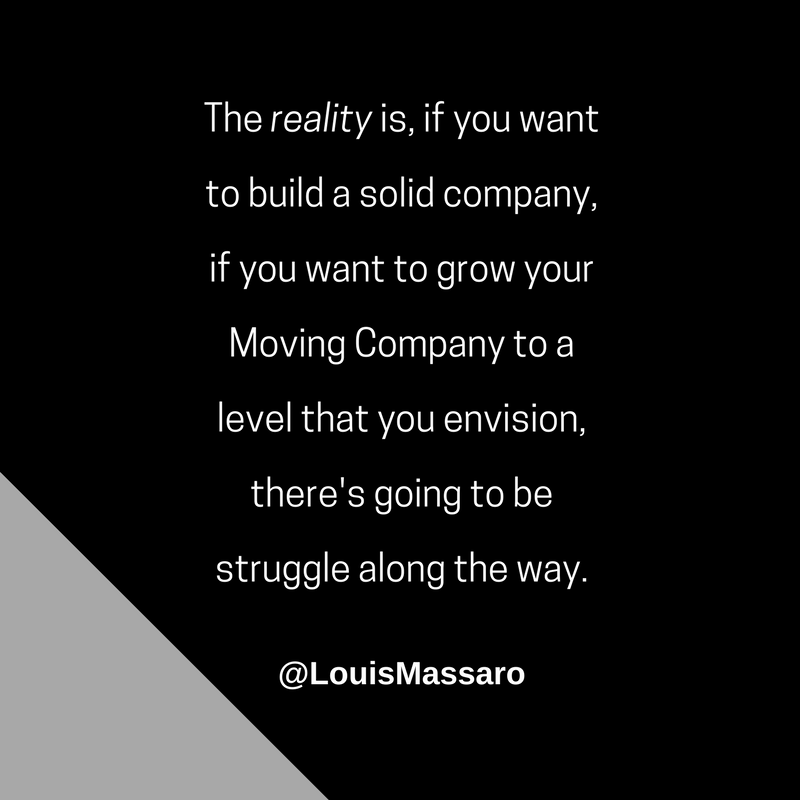 The reality is, if you want to build a solid company, if you want to grow your moving company to a level that you envision, there’s gonna be some struggle along the way. Nowadays, everyone’s looking for the quick hack or the quick fix on how to do something. There is no quick fix in the moving business, but there are processes that you can set up along the way to help make things run smoother. There’s going to be some struggle along the way. Accept that. It’s just part of it, and it’s making you a better and stronger version of yourself. Every time you hit a wall that you feel is stopping you, you have a choice. You either back down and become a lesser version of what you can become, or you choose to overcome that struggle, take it as a lesson, figure out what you need to learn to overcome it, and become a stronger and better leader because of it! 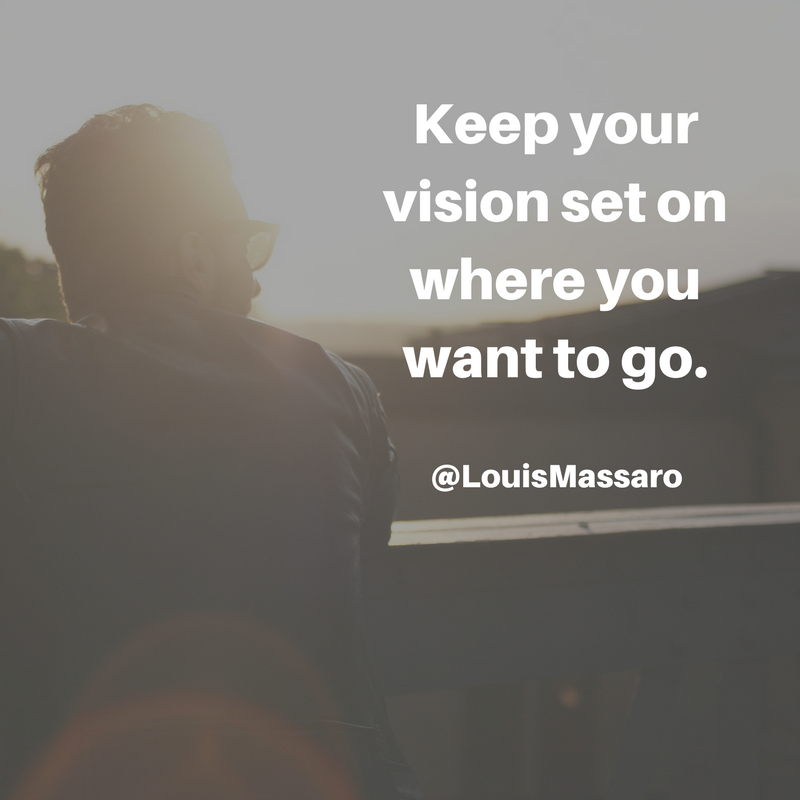 Keep your vision set to where you want to go. Always remember WHY you’re doing what you’re doing, and keep going! Hey, my friend. It’s Louis Massaro, CEO of Moving Mastery and founder of Moving Sales Academy. Recently, I got a few messages on Facebook, and there was a few things that they were talking about, but it really boiled down to them saying, “This business isn’t easy. The moving business is tough.” One of them thought about giving up. And I just wanna say, I might talk a lot about setting up smooth processes and having everything run really smooth, but this business is a struggle. Anything that you want to achieve, any goal that you’re after, there’s gonna be struggle along the way, but you have to respect that struggle. That’s part of the process. 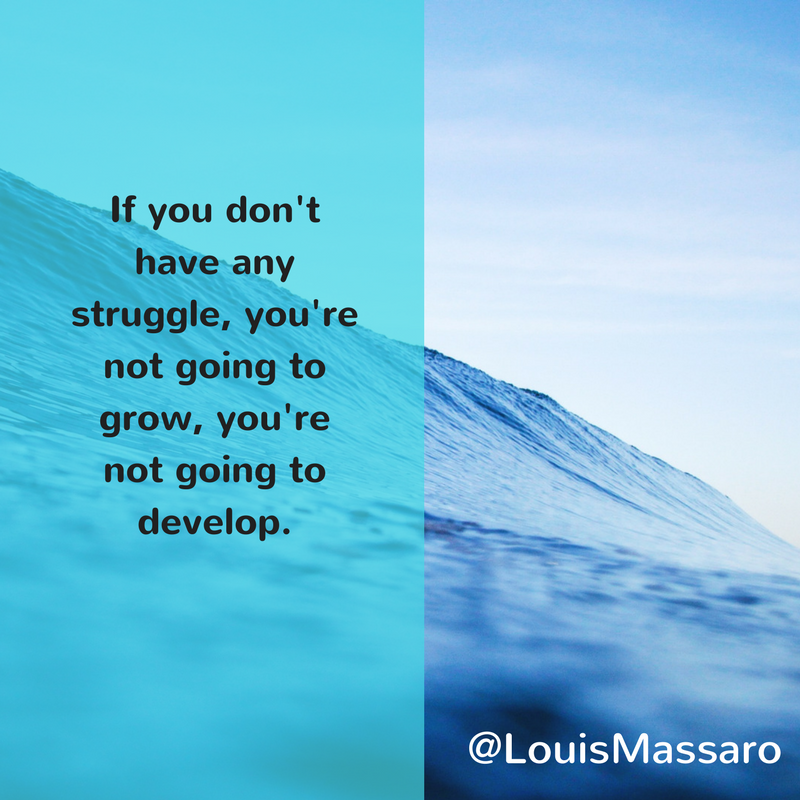 If you don’t have any struggle, you’re not gonna grow, you’re not gonna develop. The struggle is pointing out the areas that you need to overcome, the areas that you need to improve. And the problem is, nowadays, everyone’s looking for the quick fix. Everyone’s looking to go online and look for the quick hack or the quick fix on how to do something. And the reality is, if you wanna build a solid company, if you wanna grow your moving company to a level that you envision, there’s gonna be struggle along the way. Accept that. It’s part of it. People say to me all the time when they see what I’m doing now, they’re like, “Why don’t you do some videos of… ” People wanna hear three easy tips on this or three easy ways to do that. And I don’t want you to misunderstand anything that I say. There’s nothing easy about the moving business. You can make it easier, you could set up processes to where your business will run much smoother than when you don’t have them. But anytime you’re trying to grow in your life or in your business, you’re gonna hit roadblocks, you’re gonna hit struggle. You just respect that struggle for what it is. There might be times where you get overwhelmed. All right. So what? You go for a walk, you take a few deep breaths. You go to sleep, and the next day you start over fresh. There’s gonna be struggle. Listen, when I started my business, I worked seven days a week, non-stop, constantly on the phone, phone always forwarded to my cell phones. Every end of the month, for two to five days, I’d sleep at the office non-stop. I’d have trucks out till 2:00 in the morning. It was a grind and that’s not where you wanna be, but sometimes that’s where you have to start. And you keep your vision on where you wanna go, you keep your vision on having a smooth-running process. You keep your vision on having people that work for you so that you don’t have to be there all the time doing it. You have your vision on large profits coming in that just makes the struggle easier and more enjoyable. But never think that the struggle is gonna go away, because the minute the struggle goes away, it means you’re not pushing yourself hard enough. It means you’re not trying to get to another level. Because any time you try to go up, whatever level you’re at now, I’m sure there was a struggle to get there. Well, if you wanna go to another level, a lot of people will back down. A lot of people get to a certain level, and they back down and don’t choose to continue to go because it was such a struggle to get to where they were at. So they just wanna stay there, they’re like, “I’m comfortable now. I’m good here.” And if that’s… Listen, if that’s true for you and you’re comfortable where you’re at, and you don’t wanna push yourself and you don’t wanna grow, that’s fine. You’re still gonna have some struggles here and there, still gonna be some things that are gonna happen. Just have to respect that it’s part of the process, part of being in business, and part of trying to just be a better person and grow a bigger business. Ask yourself, what roadblocks have you run into? What struggles have you run into that maybe you’ve backed off of a little bit or that cause you to question your intention to grow or made you feel like you wanted to give up altogether? It’s just struggle, that’s all it is. We all go through it. It’s not something that anyone avoids. You might see somebody doing something, and it looks like it’s really easy for them, but that’s because they’ve set up their own set of disciplines, their own routines, their own hard work, their own way of doing things that it seems easier. But you know what? Everybody hits the struggles. It’s just how you deal with the struggle, how you overcome the struggle. The first thing you need to do, respect the struggle. Respect that it’s gonna happen, know that it’s part of the process, know that it’s making you better. ‘Cause every time you hit a struggle, every time you hit a wall that you feel is stopping you, you have a choice. There’s a fork in the road, okay. You either back down and become a lesser version of what you can become or you choose to overcome that struggle, take it as a lesson, figure out what you need to learn to overcome it, and become a stronger, better leader because of it, alright? It gets hard. 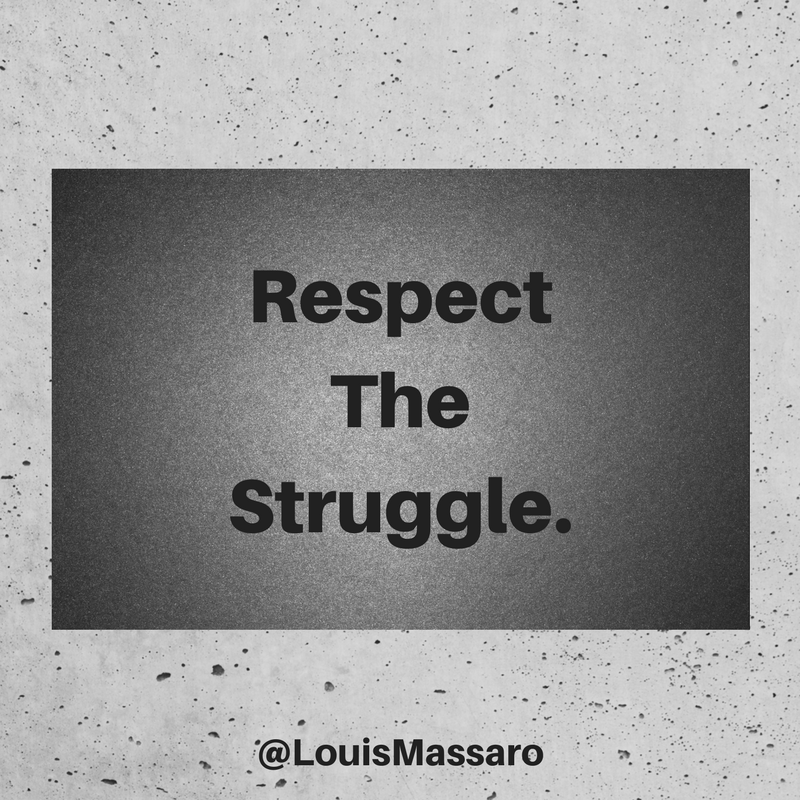 Respect the struggle, go out there every single day, profit in your business, thrive in your life, respect the struggle. I’ll see you next week.